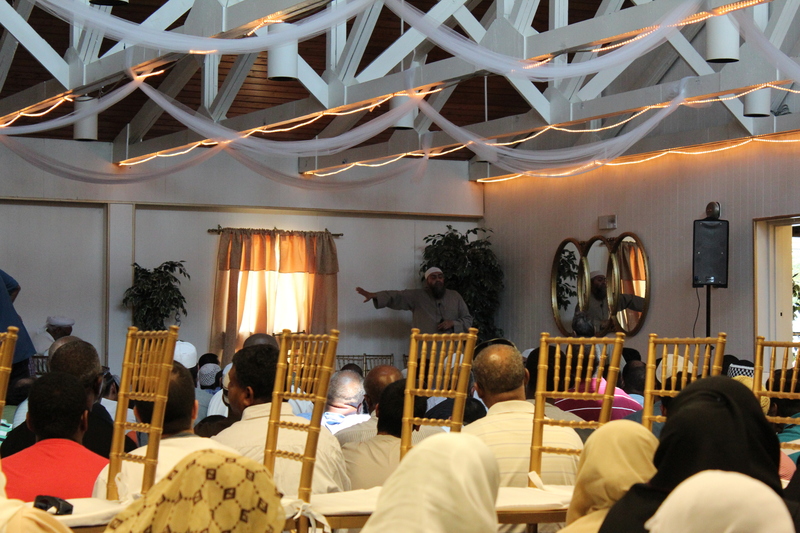 Safi Khan, the imam of the Dar us Salaam community leading Friday prayers at the Knights of Columbus in College Park, Md. I haven’t yet gotten over my fear of using flash. The chairs serve to preserve the space for women. On a previous occasion, when large numbers were expected, preference was given to the men and women were excluded from the hall and forced to pray in a dark basement. On that day, one sister not frequently able to attend Friday prayers told me she had been “looking forward” to coming but when she saw that women were relegated to the basement she was so disappointed and disheartened that she nearly turned around and walked out. 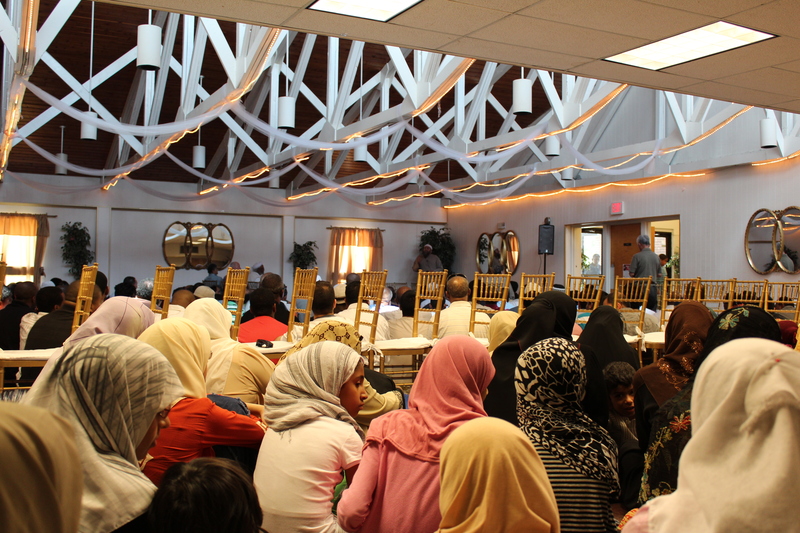 The setup in this rented space is one of the few I’ve attended in the DC area where women have an unobstructed view of the imam without recourse to television monitors or peeking through the partitions and barriers. The Knights of Columbus was founded as a Roman Catholic social organization. There’s a swimming pool out back, the women in the back pray next to a bar, and there’s the occasional Budweiser truck delivery during Friday prayer. Gotta love these interfaith spaces! 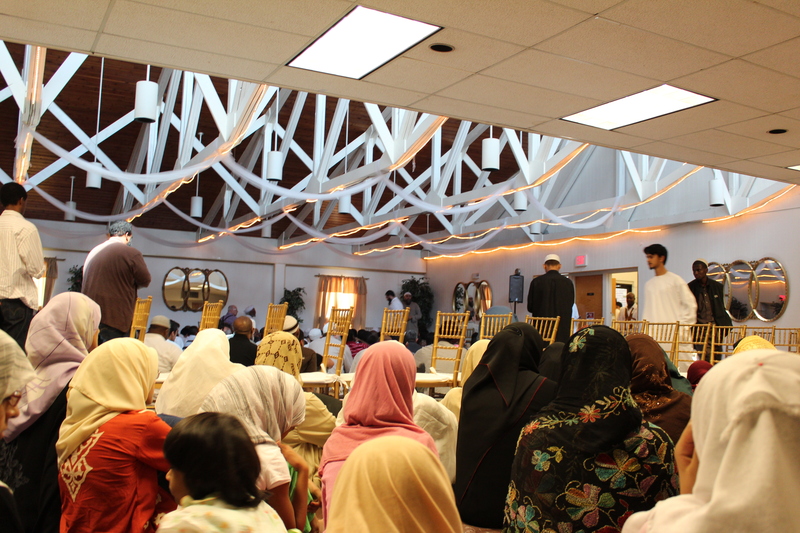 At Dar us Salaam’s regular musalla, men and women pray side by side but are separated by a large Green Monster curtain. “large Green Monster curtain” – gotta love that description! There’s an abattoir in Toronto that is used by both Jews and Muslims – and is owned by a Christian! Is the Dar us Salaam’s regular musalla not used during Ramadan as it’s too small? 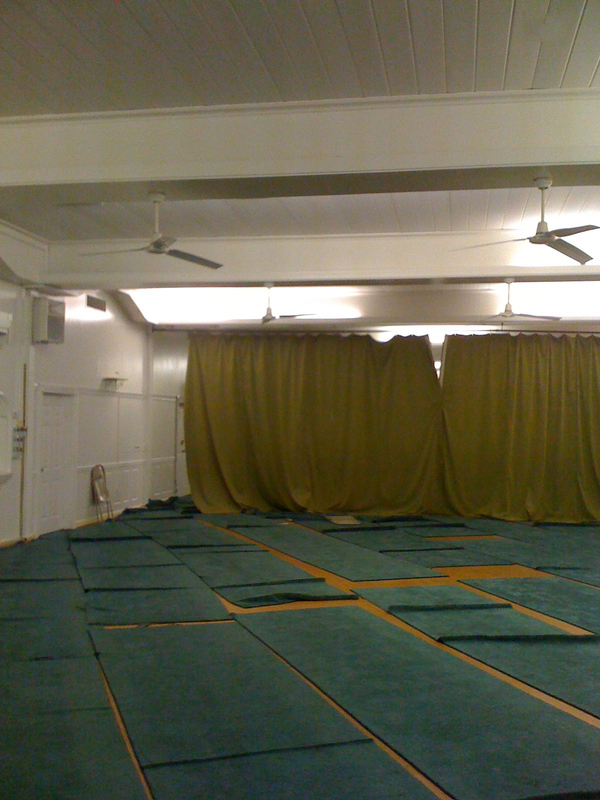 The regular musalla is actually much larger but due to zoning and parking issues it can no longer be used for jumu’ah, tarawih, or eid salah. There have been various iterations of barriers in that musalla including bookshelves of varying heights but the current setup reminds me of the infamous wall at Boston’s Fenway Park. I don’t watch baseball but will always be a Yankees fan. DUS has gone through so many wall re-incarnations! I like when they had the bookcases, they actually served a purpose. I’m sad that the musalla can’t be used anymore…any timeframe when it will be able to again…I miss you guys! We miss you as well. I think it’s a never for the old musalla, too many zoning and parking issues. They were looking into purchasing a new building but haven’t heard anything about that lately. Regular salah and jumu’ah for the teachers and kids is still there during the school year. Definitely feel a loss of baraka in the community without the musalla or the sooqs there anymore.